Click here to see a trailer for Beautiful Boy. 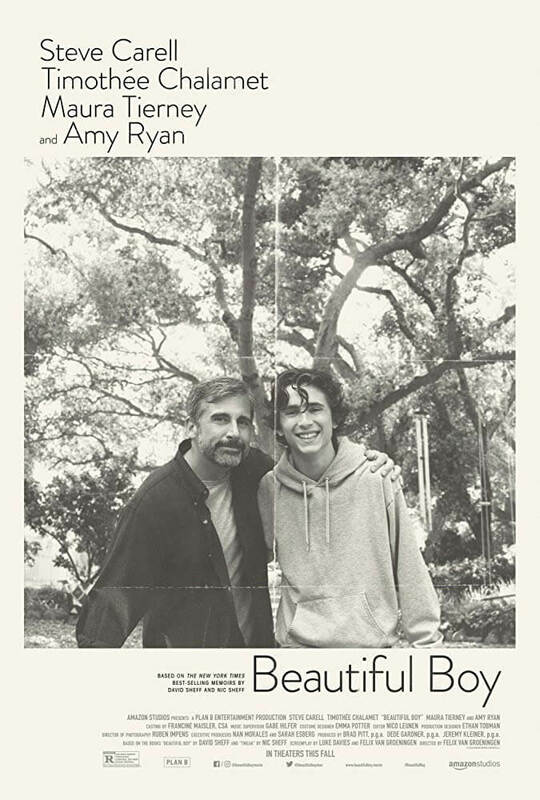 Beautiful Boy is based on the best-selling memoirs from father and son. This R rated film follows the chronicles of heartbreaking and inspiring experience of survival, relapse, and recovery in a family coping with addiction over many years. 3,843 IMDb Users have given Beautiful Boy a weighted average vote of 7.3 / 10 stars. Users say all schools and drug refrom programs should have a mandatory viewing of this film. Beautiful Boy has excellent performances and an extremely authentic portrayal of addiction and its damaging effects on family and self. Critics on Rotten Tomatoes rated Beautiful Boy at a 69% on the Tomatometer. Critics say the standout performances by Timothee Chalamet and Steve Carrell elevate this important drama about a family coping with the effects of crystal meth addiction. Overall the critics say the actors do powerful work to this even more powerful story line. Critics on Metacritic rated Beautiful Boy at a 63 on the Metascore board. This generally favorable Metascore is based on 28 positive reviews, 14 mixed reviews, and 0 negative reviews. Critics say Beautiful Boy keeps you on the edge of your seat for nearly all of its runtime, and sometimes it feels less like a movie than an endurance test. This movie’s endurance test is one that’s loving and meticulously made, but maybe too much like real life for some with an impressionistic series of highs and lows. 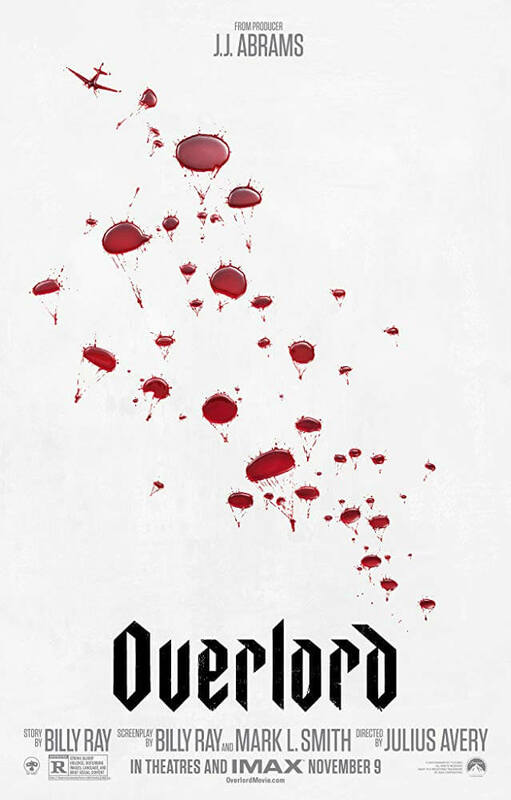 Click here to see a trailer for Overlord. Overlord is part revisionist war drama, part zombie thriller, and part all-out gorefest. This movie is perfect for anyone who enjoys a good adventure, action and suspense film. 12,604 IMDb users have given Overlord a weighted average vote of 7.1 / 10 stars. Users say it’s a brilliantly structured story filled with remarkably well-developed characters and a phenomenal cast, led by Jovan Adepo. Julius Avery provides a captivating and intense rollercoaster of genres and tones, delivering a film with very different levels of entertainment due to the many styles present. Critics on Rotten Tomatoes rated Overlord at a 80% on the Tomatometer. Critics say Overlord takes many elements you’ve seen before and creates a mashup that’s able to deliver some gory fun, riveting suspense, zombie horrors, and terrifying depictions of modern war in equal measure. 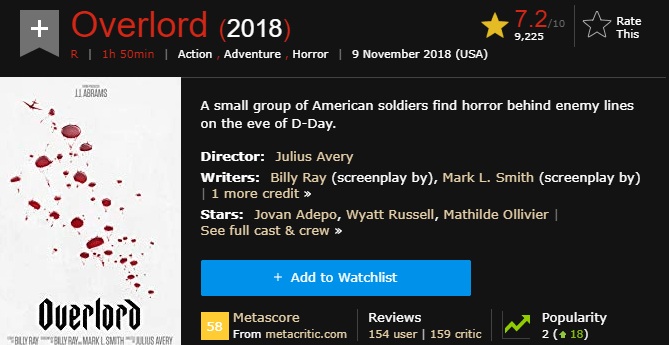 Critics on Metacritic rated Overlord at a 58 on the Metascore board. This mixed Metascore rating is based on 15 positive reviews, 7 mixed reviews, and 3 negative reviews. Critics call Overlord big, nerve-wracking, and utterly ridiculous at times – but it is a lot of fun along the way. Just be prepared for blood, guts, and gore. Robert Redford’s latest film, The Old Man & the Gun, which he has said may be his last, may also be his best one and is certainly among the peaks of his career. He has conferred his formidable art to one of the best filmmakers of the time, David Lowery, who both wrote the script and directed the film. 3,535 IMDb users have given The Old Man & the Gun a 7.3 / 10 stars. Users say this is just a fine movie. It is powered by the performances of its legendary cast. It will make you smile throughout the movie. 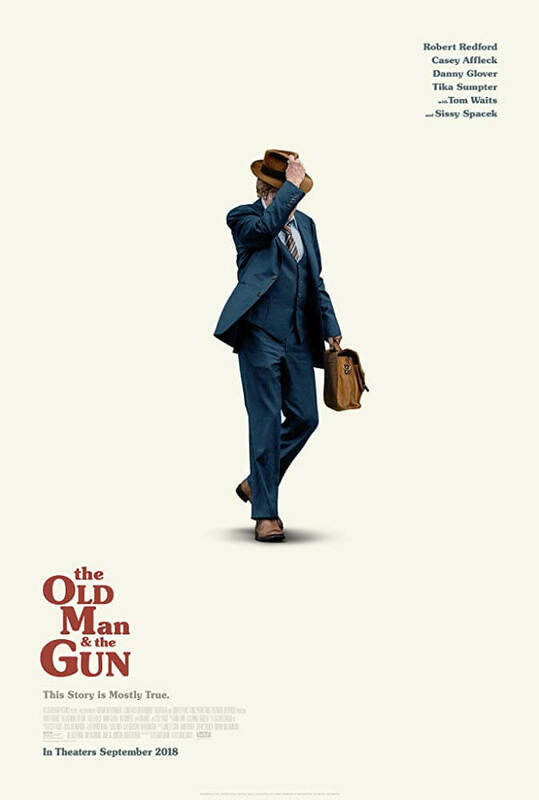 Critics on Rotten Tomatoes rated The Old Man & the Gun at a 90% on the Tomatometer. Critics say if this is truly Robert Redford’s final performance, he’s going out with an exclamation point. The film is entertaining and engaging, with plenty of character to be involved with. 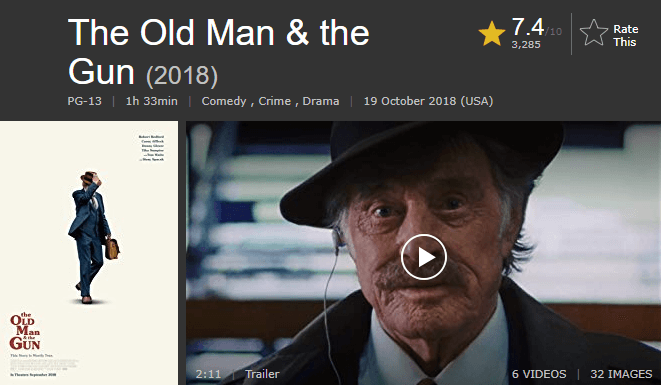 Critics on Metacritic rated The Old Man & the Gun at a 79 on the Metascore board. This generally favorable Metascore is based on 41 positive reviews and 2 mixed reviews. Critics say the magical chemistry between Redford and Spacek cannot be overestimated. Writer and director David Lowery also isn’t trying to convince us of anything, other than the fact that he has a excellent story to tell us.